ORIGINAL SF TRADE PAPERBACK. Humanity is not alone in the universe. Across the galaxy, a war rages between advanced alien races. And its about to be brought to our doorstep. 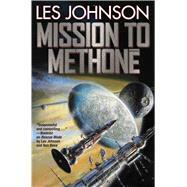 Les Johnson is a NASA physicist and author. By day, he serves as the Senior Technical Assistant for the Advanced Concepts Office at the NASA George C. Marshall Space Flight Center in Huntsville, Alabama. In the early 2000s, he was NASA’s Manager for Interstellar Propulsion Research and later managed the In-Space Propulsion Technology Project. He was technical consultant for the movie Lost in Space and has appeared on the Discovery Channel series, Physics of the Impossible in the “How to Build a Starship” episode. He has also appeared in three episodes of the Science Channel series Exodus Earth. He is the author of Rescue Mode, coauthored with Ben Bova, as well as Back to the Moon and On to the Asteroid, both coauthored with Travis S. Taylor. He is the coeditor of the science/science fiction collection Going Interstellar.